In the series introduction The Greatest Story Ever Told we saw how the central message of the bible, the gospel, is best understood as a story or a four-act drama that displays the historic unfolding of God’s creative and redemptive work in the world. And how you can never fully understand the meaning of your personal life story until you understand how your story fits with God’s story. In Act One, Creation: The Way Things Are Supposed To Be,” we learned that the essence of salvation in Christ (the gospel) is the outworking of God’s love by restoring his creation from all the horrible consequences of sin (the fall). And how you cannot fully know the riches of Christ’s salvation until you more fully grasp God’s original intent for mankind to be in perfect relationship with God, self, others and creation. We turn now to Act 2, the fall of mankind. Your understanding of the severity of a problem is directly proportionate to your understanding of the significance of the solution. If you don’t believe you have a problem, then a solution to that problem seems irrelevant. If you believe your problem is minor, your appreciation of the solution to that problem is seen as minor. Only when you know you have a major problem will the solution to that problem be fully understood and appreciated. We look now at Act two of the greatest story ever told, the fall of mankind. In order to appreciate the good news of the gospel you must deeply understand the bad news about all the consequences of the fall–mankind’s rebellion against God. A gospel that is not a remedy to all the consequences of the fall is less than the true gospel. A limited understanding of the gospel often results in a false assurance (or lack of assurance) of salvation, a lack of spiritual maturity and a minimal impact on the world for good. The degree to which you understand sin and all its negative effects on your life and the world is the degree to which you will understand the gospel and all its positive effects on your life and world. To better understand the good news of Jesus Christ, we need to look at the beginning. As we saw earlier, in the beginning the world was a paradise created by God that constantly brought glory to him. God was honored and enjoyed as his created people flourished. They reflected his image in their perfect relationships with God, themselves, others and creation. But this paradise did not last long. Evil entered the world through a real villain, Satan, who hated the paradise and enticed mankind to disobey God. When sin entered the world something terrible happened—not only to people but also to all of creation. Paradise was lost. As a result of sin, all of mankind’s perfect relationships (with God, themselves, others and creation) were broken and marked by alienation. This is why things are not the way they were designed to be. There are three consequences of sin that represent the effects of the fall: 1) personal guilt, 2) heart corruption, and 3) world corruption. Because of sin mankind’s relationship with God changed from a state of innocent obedience to a state of guilty disobedience. Man lost his original right standing with God and became alienated from him. One of the tragic results of sin is becoming guilty before God under his just judgment. The result of sin is death, both physical and spiritual death—eternal separation from God in hell (Matt 5:29, 23:33; Heb 9:27; 2 Thess 1:9). Although God is loving and merciful and does not want to punish us, he is also perfectly just so, like an honest earthly judge, he must punish sin (1 Pet. 1:16, Mt. 5:21–28, James 2:10). Sin not only separates us from God and places us under his just judgment, it also defiles and enslaves us. Sin is not just a legal problem before God–it’s also a deep problem of the heart (Mark 7:20-23). Sin is trying to find ultimate happiness in life apart from God and his purposes. It enslaves us. Jesus said, “Truly, truly, I say to you, everyone who commits sin is a slave to sin ” (John 8:34). Sin is more than disobeying God’s laws. Sin is a deep-seated, invisible and terminal disease. Outward sins are the result of inward sins of the heart (Gal 5:19-21). So we need not only forgiveness from sin’s condemning penalty but also freedom from sin’s corrupting and dominating power. Sin not only condemns and enslaves us personally, it also impacts the whole world—every area of our culture and society. All of God’s good creation has now been disrupted by the fall of mankind into sin. As a result of the curse of God on mankind, all creation has been cursed (Gen 3:14-19, Rom 8:19-23). This is why life is not the way it’s supposed to be. All suffering, injustice, decay and death can be traced back to our rebellion against God. This is why there is pain, suffering and injustice in the world. This is why there is murder, poverty, hunger, disease and racism. The world is not as it should be. Mankind and creation are in desperate need of restoration. In Act 2 of the All Things New series, Fall: The Way Things Are Not Supposed To Be, we learned that because of sin, mankind’s 1) perfect standing with God was lost (resulting in condemnation, guilt, and separation), mankind’s perfect life with God was lost (resulting in death, captivity, and corruption), and mankind’s perfect world with God was lost (resulting in alienation from God, self, others, and creation). In Act 3 of the All Things New series, Redemption: The Coming Kingdom, we will learn how God, through the nation of Israel and the person and work of Jesus Christ, by his Holy Spirit, graciously provides a redeemed standing, a redeemed life, and a redeemed world. 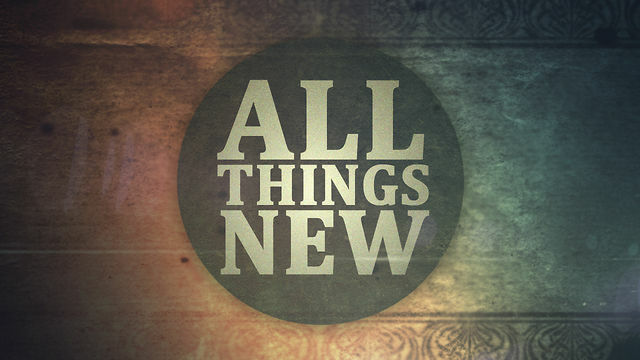 In Act 4 of the All Things New series, Restoration: The Way Things Will Be (The Not Yet Kingdom), we will catch a life-changing glimpse of the consummation of this grand story in God’s gift to mankind of a new standing, a new life, and a new world–as he makes all things new.